ERoSC is an exploratory research project that aims at studying the socio-economic impact of emerging social computing applications. The exploratory research scheme of the European Commission Joint Research Centre’s Institute for Prospective Studies (IPTS) is an internal instrument aimed at building up competence in strategically relevant scientific fields. The ERoSC project has been awarded as the IPTS 2007 Exploratory Research project. Its purpose is to identify and discuss current and future socio-economic implications of social computing and to identify policy options for Europe. In less than five years, social computing (SC), that is, digital applications that enable interaction and collaboration, whereby users are participants (co-creators not end-users) and interconnected (the network as a collective resource), has shifted from a niche activity into a phenomenon engaging tens of millions of Internet users. Nevertheless, there is very little research and evidence on the socio-economic impact of SC in the European context. 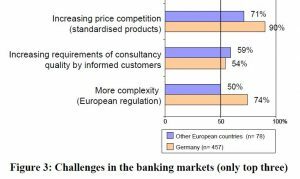 assess the position of Europe in this field; and identify options for EU research and innovation policies. Technological innovations have been scanned for available supply and demand data. Usage and the impact of SC in specific sectors have been explored using different analytical techniques, such as case studies, comparison of existing data and in-depth interviews. Finally, an expert workshop was conducted to validate the data. Peer reviewing by experts was used as an additional quality management tool. Social Computing is entering into a new stage of development. Blogging, photo- and video-sharing, social networking and social gaming have been adopted by some half of Internet users worldwide (around 25% in Europe), and high levels of growth in Europe have been reported in areas like blogging or online video. New social platforms are emerging that enable people to create more and richer content, which in turn generates network effects. 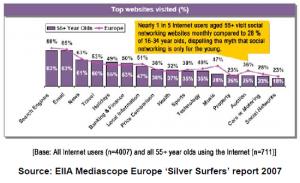 Social computing activates new market segments, for instance women or ‘silver surfers’ (people aged 55 or older). People interplay with technology in many different ways. The majority of users tend to be ‘free riders’, that is, using SC content created by a ‘thin’ layer of core users (the ‘creators’). 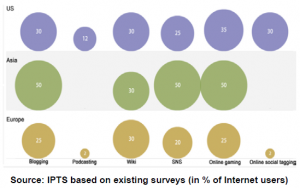 In Europe, roughly a third of Internet users also make use of SC contents, 10% provide feedback, 10% share contents, and only around 3% are those ‘creators’. Moreover, the intensity of use of SC applications is very diverse, for instance, people can be at the same time ‘creators’ and ‘free riders’. Mobile – the ‘Next Frontier’? A lot of innovation is taking place around mobile social computing. Mobile social computing, however, does not mirror the user participation of desktop-based social computing. Only a small user base has so far adopted mobile social computing, though there is evidence of growth. 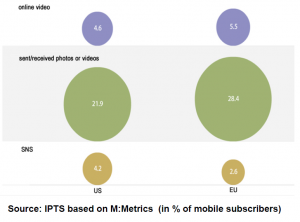 In the EU (selected countries), almost a third of mobile subscribers upload videos or photos on video/photo-sharing sites, with only 2.6 % accessing a social network via their mobile phones and 5.5 % watching video online. Teens are the most active users of mobile social computing. Social computing allows for more room for personal and social creativity, and it is a new means to develop and construct personal identities. Moreover, identity is now transformed by technology. The ‘always–on’ trend raises concerns about this new form of dependency, where people need to first communicate with others to feel their own feelings. The networks of virtual ‘friends’ becomes as significant as ‘real’ life ones, evolving into new forms of social capital that is, social computing will encourage social networks that are well connected (bonding social capital) rather than bridge between different networks (bridging social capital). The proximity of celebrity condition gets closer (‘my 15-minutes of fame’). Social computing allows for enhanced social participation, for instance in politics, and better informed citizens for different roles in society, such as as a voter, learner, patient or consumer. At the same time, the dynamics of privacy is changing. Personal data recorded in databases are ‘perfectly transferable in space,[and] indefinitely preservable in time’ (Poster 1995). New social threats are emerging such as stalking and bullying or chains of suicides. Social computing provides sources of revenue both for users and platforms. More important, social computing is a driver for competitiveness. Impacts can be observed on industry itself, for example media or ICT industry, but also on other industries using SC. More targeted marketing and user research, both based on user profiles and content interests, are opening new channels to markets. New employment possibilities are emerging through social networks and new opportunities to utilize user innovations for product development or as an interface between companies and customers and for more efficient work processes. In order to realize the potential positive impact, there is a need to meet a number of challenges of productivity, security and training. In order to put forward informed policy implications, proper measurements are needed. There is a lack, however, of internationally comparable data on social computing from national statistical sources, while data is available coming mostly from non-official sources. This points to the need for better and systematic measurements and internationally comparable data. Improvement of official statistics (e.g. OECD, Eurostat) by adding categories of Internet use by activity questions to surveys could be one possible avenue for meeting this need. The implications of social computing for policies for education, health, inclusion and for the policy making process itself should be considered. In addition, policies could be developed to provide the necessary framework conditions that would favour people and companies (in particular start-ups) staying in Europe, including promoting entrepreneurship and dealing with intellectual property rights (IPR) and copyright issues that might prevent the further development of SC. There is also room for policy activities to address social cohesion and exclusion of groups of people such as elderly and migrants, to support democratisation and eParticipation processes. Another European strength lies with mobile technologies and mobile connectivity, together with a marked lead in mobile devices, hence providing a possibility for Europe to further develop relevant services, applications and platforms for mobile 2.0. An opportunity for Europe would also be to provide better access to public data, as such data are typically used in SC applications (e.g. mash-ups) to provide added value. Opening public data sets to allow citizens to create their own services could provide a boost to the use of SC, providing privacy and security concerns are adequately accommodated. http://is.jrc.ec.europa.eu/ is the main website where all reports and other information will be made available. Ala-Mutka, K. (2008), “Social Computing: the case of collaborative content”, IPTS Report, European Commission, forthcoming. Cachia, R. (2008), “Social Computing: the case Social networking”, IPTS Report, European Commission, forthcoming. In the last few decades, scenarios have provided a way of analysing the implications of alternative futures, especially as they might be impacted by new technologies. This has been no less true of ambient intelligence (AmI), which may be embedded everywhere in the not so distant future. 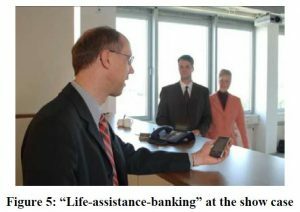 Most of the scenarios developed by AmI enthusiasts have been rather “sunny”, showing how new technologies promise to make our lives more productive and enriching. A European project called SWAMI (Safeguards in a World of Ambient Intelligence) deliberately developed “dark scenarios” to highlight the threats to privacy, identity, trust and security and inclusiveness posed by new technologies. This brief describes the SWAMI scenarios and the methodology used to construct and analyse them. While most AmI scenarios paint the promise of the new tech-nologies in sunny colours, there is a dark side to AmI as well. In a way, this dark side is inherent in the very nature of AmI, for instance, the fact that AmI technologies will deliver per-sonalised services to users means that somewhere a lot of per-sonal information needs to be stored about the user. That being the case, there are risks that the user’s personal information can be abused, either accidentally or intentionally. These risks have been recognised by policy-makers and researchers, and were at the heart of the SWAMI project, funded by the Euro-pean Commission under its Sixth Framework Programme. The project began in February 2005 and finished 18 months later. The SWAMI consortium had five partners: the Fraunhofer Institute for Systems and Innovation Research (Germany), the Technical Research Center of Finland (VTT Electronics), Vrije Universiteit Brussel (Belgium), the Institute for Prospective Technological Studies (IPTS, Spain) of the EC’s Joint Research Centre, and Trilateral Research & Consulting (UK). One of the tasks of the project was to create and analyse four dark scenarios that highlight the key socio-economic, legal, technological and ethical risks to privacy, identity, trust and security posed by new AmI technologies. They were called “dark scenarios”, a term coined to signify things that could go wrong in an AmI world, because they present visions of the future that we do not want to become reality. The objective of the scenarios was to expose threats and vulnerabilities as a way to inform policy-makers and planners. Dark scenario 1: A typical family in different environments – presents AmI vulnerabilities in the life of a typical family moving through different environments. It introduces dark situations in the smart home, at work and while taking a lunch break in a park. Dark scenario 2: Seniors on a journey – also references a family but focuses more specifically on senior citizens on a bus tour. An exploited vulnerability in the traffic system causes an accident, raising many different problems related to both travel and health AmI systems. Dark scenario 3: Corporate boardroom & court case – involves a data-aggregating company that becomes the victim of a theft of personal AmI-generated data that fuel its core business. Given its dominant position in the market, the company wants to cover this up but ends up in court two years later. The scenario also highlights the disparities between countries with AmI networks and those without. Dark scenario 4: Risk society – from the studios of a morning news programme, this scenario portrays the AmI world as a risk society. It presents an action group against personalised profiling; the digital divide at a global scale and, related to environmental concerns, the possible vulnerabilities of AmI traffic systems and crowd management. 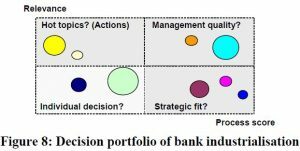 This first step summarises the scenario in question and explains its context – who are the main actors in the scenario, what happens to them, what they do, how far into the future is the scenario, where does it take place and in what domain (home, office, on the move, shopping, etc). It identifies the type of scenario (trend, normative, explorative) and key assumptions (e.g., intelligent technologies will be embedded everywhere in rich countries, but not in poor countries). Next, the most important AmI technologies and/or devices used and/or implied in the scenarios are identified. The analysis then considers the applications that emerge in each scenario and that are supported by the technologies mentioned in the previous step. 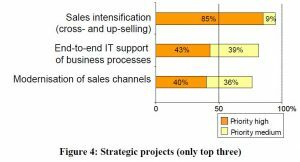 The analysis identifies the key drivers that impel the scenario or, more particularly, the development and use of the applications. Drivers are typically socio-economic, political or environmental forces, corporate ambitions or personal motivations (e.g., greed). Next, the major issues raised by the scenarios are identified and explicated. A discussion of the issues considered the threats and vulnerabilities exposed by the scenario, their impacts and legal implications. The final step is a reality check of the scenario itself (how likely is it?) and a consideration of what should be done to address the issues it raises. The SWAMI scenarios highlighted many of the threats and vulnerabilities that we foresee afflicting the AmI world. The principal difference (in our view) between an AmI world and that which we know today is the scale of the data available. When everything is embedded with intelligence, when AmI is pervasive and invisible, when everything is connected and linked, the threats and vulnerabilities that we know today will multiply. In an AmI world, we can expect to be under surveillance (“transparent”) wherever we go because the permanent and real-time registration and processing of our presence and behaviour is the precondition – the “code” – of ambient intelligence. The main privacy-protecting principles in network applications are anonymity, pseudonymity, unlinkability and unobservability. The main difference between existing network applications and emerging AmI applications is two-fold: first, in the former case, the user has some understanding of which data about him or her are collected, and has some means to restrict data collection: e.g., to use a public computer anonymously to access certain web pages; to switch off his or her mobile phone, to pay cash instead of using a web service, etc. In the latter case, with the environment full of numerous invisible sensors (and video cameras), it is difficult, if not impossible, for users to understand and to control data collection and to achieve unobservability, anonymity and pseudonymity. Intelligent data processing, limiting linkability and implementing strong access control to collected data seem to be the main ways of protecting privacy in such applications. However, such applications present potential privacy threats anyway if the police, intelligence agencies, family members or criminals can search through devices that store personal data. A second important difference between existing network applications and emerging AmI applications is that neither mobile devices nor web usage penetrates through such strong privacy-protecting borders as walls and the human body, but physiological, video and audio sensors, proposed for AmI applications, will have much stronger capabilities to identify a person and to reveal personal activities and feelings. developing user-friendly means for recovery when security or privacy has been compromised. media attention, bad publicity and public opinion. new AmI environment should be addressed by transparency tools (such as data protection and security measures). Transparency should be the default, although some prohibitions referring to political balances, ethics and core legal concepts should be considered too. A set of rules needs to be envisaged to guarantee procedural safeguards similar to those currently applicable to the protection of our homes against state intervention (e.g., requiring a search warrant). Technical solutions aimed at defending private digital territories (the private sphere of the individual no matter where he is) against intrusion should be encouraged and, if possible, legally enforced. The individual should be empowered with the means to freely decide what kind of information he or she is willing to disclose. Such protection could be extended to the digital movement of the person, that is, just as the privacy protection afforded the home has been or can be extended to the individual’s car, so the protection could be extended to home networks, which might contact external networks. All employees should always be clearly and a priori informed about the employee surveillance policy of the employer (when and where surveillance is taking place, what is the finality, what information is collected, how long it will be stored, what are the (procedural) rights of the employees when personal data are to be used as evidence, etc.). The status of pseudonymity under the law needs further clarification, whether pseudonyms should be regarded as anonymous data or as personal data falling under the data protection regime. The obligation of data protection law to inform the data subject about when and which data are collected, by whom and for what purpose gives the data subject the possibility to react to mistakes or abuses, and enables him to enforce his right in case of damage. It would be desirable to provide the individual not only with information about what data are processed, but also what knowledge has been derived from the data. This might imply a rethinking of data protection law. A means to prevent data laundering could be envisaged which would create an obligation for those who buy or otherwise acquire databases, profiles and vast amounts of personal data, to check diligently the legal origin of the data. An obligation could be created to notify the national data protection authorities when personal data(bases) are acquired. Those involved or assisting in data laundering could be subject to criminal sanctions. Profiling practices and the consequent personalisation of the ambient intelligence environment lead to an accumulation of power in the hands of those who control the profiles and should therefore be made transparent. Simply identifying safeguards is not sufficient, of course, so the SWAMI consortium went further and specifically addressed recommendations to the European Commission, member states, industry, academia, civil society organisations and individuals. The reader interested in more details should consult the references below. Wright, David, Serge Gutwirth, Michael Friedewald et al., “Privacy, trust and policy-making: challenges and responses”, Computer Law and Security Review, Vol. 25, No. 1, 2009 [forthcoming]. Wright, David, Serge Gutwirth, Michael Friedewald et al., Safeguards in a World of Ambient Intelligence, Springer, Dordrecht, 2008. 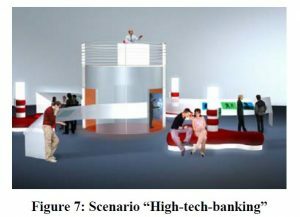 Wright, David, “Alternative futures: AmI scenarios and Mi-nority Report”, Futures, Vol. 40, No. 1, June 2008, pp. 473-488. 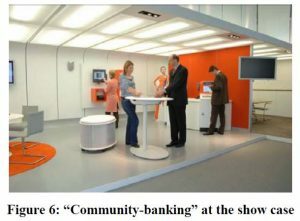 Wright, David, Michael Friedewald et al., “The illusion of security”, Communications of the ACM, Vol. 51, Issue 3, March 2008, pp. 56-63. Wright, David, Serge Gutwirth and Michael Friedewald, “Shining light on the dark side of ambient intelligence”, Fore-sight, April 2007, pp. 46-59.